I often catch myself saying, “Why didn’t I learn this in school?” This is ironic because I have not been out of school long and I am a teacher! What money lessons do you remember from school? Even as a millennial I feel like I left school not being prepared for the real world financially. As a fourth grade teacher, my students come to me with a basic knowledge of money. However, as they progress through school, like I did, who is responsible for teaching more important money lessons? Parents … teachers … the internet … The $avvy Couple? 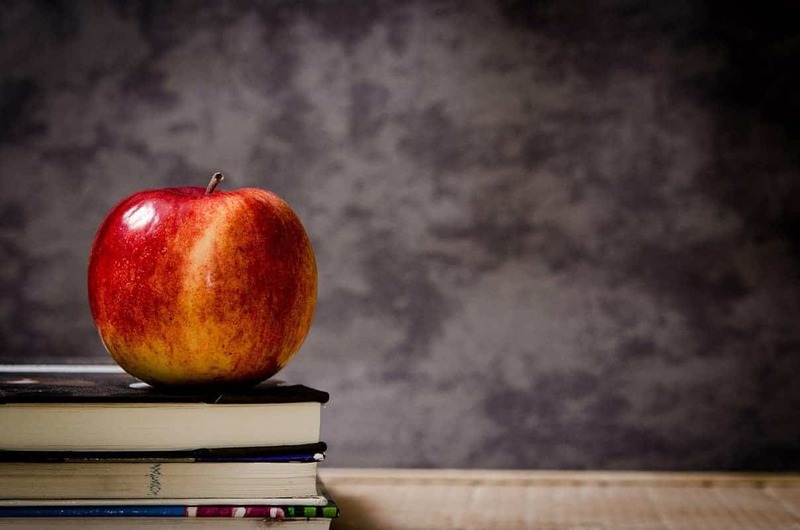 This is our list of 8 important lessons you should have learned from school or your parents. What are some money lessons that you think should be taught? Share below or on our Facebook page! Credit cards are an important tool to build credit. However, they are the worst debt to carry. The biggest lesson about credit cards is that you should NEVER carry a balance. Interest rates on credit cards are ridiculously high averaging somewhere around 15%. You never want to get stuck in a trap where you are only paying the minimum balance. This is a money maker for credit card companies and you will be stuck on the hamster wheel forever trying to pay it off. If you are opening a credit card you must be responsible. Start out small and make sure you are able to pay off each bill. As long as your responsible credit cards can have some great benefits, cash back, miles and building credit to name a few. Money Lesson: Credit cards are a great tool to build credit and earn rewards. However, you should only spend what you can pay off immediately. Being frugal is definitely a lifestyle we want to help more people live. Making small daily or weekly changes to your lifestyle can have huge effects on your personal finance. I think when people think of the word frugal, they think cheap. I know my brother does. There is a huge difference between being frugal and the TLC show Extreme Cheapskates. We are not saying to live on candlelight and hang out by dumpsters of restaurants/bakery’s and wait for them to take out the trash. That’s just disgusting. Being frugal is being intentional with your money and always getting the best value. You can live a frugal lifestyle that is extreme. Start out small and reduce the number of coffee stops you make in a week then a month then a few months. Stop eating out so much! Get over having to have name brand items. We do most of our grocery shopping at discounted stores like Aldi’s, PriceRite, or Walmart. Comparing the ingredients to the name brand ingredients they are often identical and significantly cheaper. Money Lesson: Living frugally is living intentionally with your money. Save in areas you can so you have financial freedom in areas that really matter to you. If you are one of our regular $avvy Savage readers you know how much we stress about having a budget. 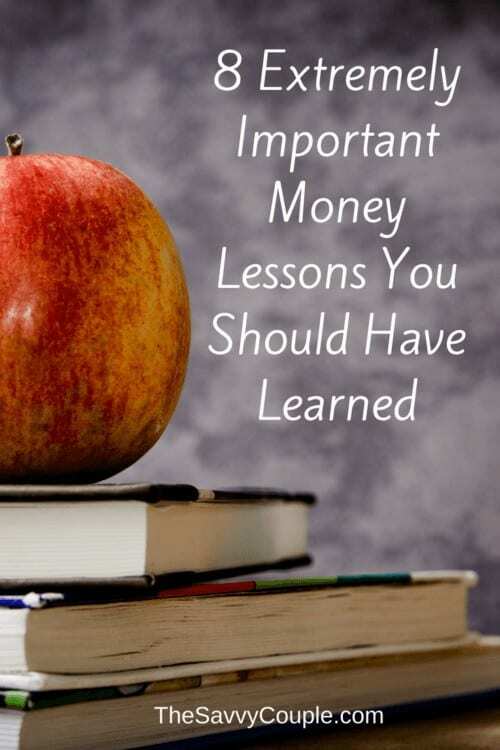 We really cannot stress the importance enough and that is why it has made it on to this list of important money lessons. Budgeting is a system that tracks your money in and out. After you get used to budgeting we recommend giving a purpose to every dollar. As children, we saw our parents spend countless hours making sure the “checkbook balanced”. Luckily, Millennials do not have to be old school anymore and balance checkbooks. It is very important to have control of your finances though. Money Lesson: Categorize your spending and know how much income you have coming in to cover these expenses. Learn the difference between wants and needs. According to Kelan, “Everything is negotiable” I, on the other hand, do not fully support that statement, but it does hold a lot of truth. If you are headed out to the grocery store a gallon of milk is not negotiable (Kelan would say different). However, something like buying a used car is completely negotiable. Being able to negotiate is definitely a skill, something Kelan is great at. You need to always do research on anything you are about to negotiate. This way you have facts to back up your negotiation battle. Kelan does all of our negotiating. We do try to negotiate everything we can. Some include; house, cars, cable, internet, phone, insurance, Craigslist or garage sale purchases, vacation, and much more. Two of the biggest things that we learned when you place a call to try to get a bill reduced is to always begin with the person’s name and asking for help. “Good afternoon to you too Sandra, I am wondering if you can help me today…”. Using someone’s first name along with “can you help me” always give you the best chance of getting what you want. Money Lesson: It doesn’t hurt to ask for a lower price on anything! The worst they could say is no. Negotiating is a battle, be prepared. Stay away from debt as much as possible! In some cases, debt is unavoidable. If you need a loan, be smart about it and shop around for the best rate. Consider other options for school. Most of us as millennials have a large amount of debt after graduating from college, this can be avoidable. Kelan and I went to a local community college for the first two years of our education. We made another smart choice to live at home and commute together to school. Kelan and I were able to walk away DEBT FREE for our first two years. Consider if living on campus and getting the highest priced meal plan is the best decision for you in the long run. It is so hard to think about life after college. However, it will be over before you know it and then the debt you accumulated will sink in. To quote the best: “Attack debt with a vengeance,” said Dave Ramsey. Using a tool like Sofi is a great way to see if refinancing your student loans would be a good option for you. Money Lesson: Try to live as debt free as possible. Do not carry any type of debt unless it is unavoidable! The media loves to pull you in for the “once in a lifetime” deals. We have all heard them before and some of us have fallen victim to the seller scams that are advertised. With living a frugal lifestyle, I do my fair share of couponing. Be careful because often times the deal might not be worth it. $1.00 off anything that causes you to buy more than two might not be worth the deal. If it is something that you go through fast or use on a daily basis, then I would say that it’s worth it. Same goes with coffee deals, after you buy 10 they will give you one for free. You have now spent over $20 on coffee just to get that next one free. Have you ever opened your mailbox and received a key from a car dealership or a scratch-off saying you won? Also, a scam to get you to come in. Use good judgment and think out the deal before you fall victim. Money Lesson: Do not fall for the advertisements that the media puts out. Rarely is the deal actually worth it. Retirement? Yes, you read that right! It is never too early to start thinking about retirement. Actually, you should have started to think about retirement yesterday! Planning for the future is SO important and you do not want to wait to start planning and lose out on potential capital gains, compound interest, and company matching. Money Lesson: Get a plan for retirement and start saving as soon as possible. What you put in now, will pay off in the long run! Growing up you do not learn a lot about taxes. This is unfortunate because we all will eventually begin to start filing and enter the 1040A, 1099 world. Most college students can file for free. One of the biggest lessons to learn about taxes is what tax credits and deductions you can claim. This is especially true with the passing of the 2017 tax reform bill as it will change a lot of taxation aspects. Another important lesson is to keep your tax papers organized. If you are filing alone or with a significant other a two-pocket folder is a great way to stay organized. Kelan places his documents on one side, I place mine on the other, and share documents hang out in the middle. We have each folder color coded to a year and this provides an easy location to look up any questions on previous years taxes. Money Lesson: Stay organized with your tax documents and check to see what credits and deductions apply to your situation. I pinned this! Great advice! These are great tips! I wish college had a class on doing taxes for the everyday person! Brilliant tips,thanks for sharing.I prefer to live frugally and save for the rainy days,what`s the point in living big now when im still strong, using money I can ill afford then hve to scrimp when tired and wrinkled. Many people could use these tips. Such great advice and I agree, so much of this isn’t taught when it’s really needed, early on! Thanks, glad you got something out of it! We agree it’s unfortunate more of this is not taught. How many of these did you know already? I definitely wish I thought about retirement sooner. But which 20 year old would think about that right??? But now that I’m older I feel like I’m rushing. It’s definitely a lesson learned. Everyone should see this! I wish it was talked about in school more, people would be so much more well off when they left school. Thank you for putting it together! No problem! Please feel free to share on social media. We think it’s important and any help we can get is greatly appreciated! Don’t be shy about signing up for our weekly newsletter. Lot’s of great content coming! Great tips! I am trying to stay frugal and making some of these mistakes! It sounds like you two are doing very well. Thank you! It can be hard at first, but when you make little changes it will snowball into bigger and better changes. We are here to help. Let us know if you have any questions about anything you have read! Great points all of them! We live a pretty frugal lifestyle but because of setbacks earlier in our lives my retirement is sorely lacking, It is the one thing I did not do well and so now I am playing catch up! We love hearing from other savvy frugal livers =). Retirement is something everyone struggles with so your not alone, we even do. I think a great tip is to start your budget with how much you want to save every month. Then do down the line of wants and needs. You will soon realize you can always improve and save more. So very true. The words “wants and needs” come out of my husbands mouth often. One thing I am very lucky about is that him and I are on the same page with all of this! Awesome to hear! It’s so important to talk about finances with your significant other on a regular basis. Do you guys use a monthly budget? It’s so hard in the beginning to learn the difference between wants and needs. We still screw up from time to time and buy stuff we really don’t need. Yes we have a monthly budget. We talk together about when we buy extras…or not! I have to admit it took us awhile for both of us to get on exactly the same page when we first got married but now after thirty years we are as one. The kids might ask either one of us something and the reply is always “I have to talk to your mother” or “I have to talk to your father”. In general we do pretty well with wants and needs. Right now I am laid off from work so we are not buying anything and have curtailed our budget down to a minimum. We are both fine with it. When I get work we can get some of those things. Even things I feel I need I have waited on. Like honestly I could use some socks, pretty basic right? I have enough, I am home so I can wash what I have. I happen to crochet so I made myself a couple pair of slippers and wear those around the house instead of socks. So I’ll wait. Being on the same page is HUGE! Sorry you’re laid off, sound like you are handling it great though. Really great information. I wish I had known what you know back in my early 20s! Better late than never right? It’s never too late to make some small changes that have BIG impact on your personal finance. Gosh this is so helpful and such an eye opener. I never looked at the idea of being frugal as a good thing, but there is definitely truth in it. You can’t be spending so freely if you want to save those bucks. Love the post! Do you follow any financial planners? These are such great lessons and i think they absolutely should be taught in school and again in college as you prepare to start handling all this on your own! Someone should be there to tell new graduates to start depositing into their brand new 401(k) asap. Totally agree! This stuff is not talked about enough. We are taught that going to school and coming out with $50k in debt is normal. This set graduates up for failure from the start. Thanks for your comments hope to see you back soon! Wish someone would have told me about student loans for sure! Instead we played the stock market game in economics class my senior year of high school lol! We played that game too! It was honestly a great lesson to learn and EVERYONE should go through an economics class teaching basic principles on how money works. I would say a majority of Millennials are struggling with student loans. It’s sad that so many of us get into a huge amount of debt just to get an education. The biggest takeaway is going to a community college, state school, or scholarship at a private. Take out as little money as possible. Totally agree! Money should be talked about way more in school, including college. Why not make it a “freshman” class that everyone has to take. We also see a movement, especially in Millennials. Since starting our blog we have been getting some awesome feedback and engagement in other Millennials that are being $avvy with their money. It’s exciting to have this platform that we can possible reach people that need the help. I’m super late to the party on this one, but thought I’d drop my two cents in. The thing one thing I remember learning in school about money was: compound interest. Which blew my mind at the time. Unfortunately I didn’t learn anything else, particularly how to harness it. But the fact that I remember this years later speaks to how powerful teaching our kids about money would be if we just do it. 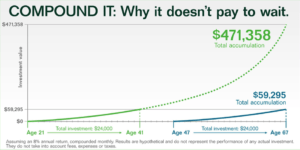 Compound interest is an incredible thing! Great points! I’ve always felt it was kinda ironic how schools taught you everything except personal finance, which is definitely a topic everyone has be aware of. But thankfully we have the internet and a plethora of great PF sites online! Now, i just need to find a place to learn my taxes, glad you brought this point up! this is really cool. most of the stuff is stuff that i already think about, but i’ve spent a long time learning some of these lessons, and would highly advise people to take this seriously.